St. Clairsville, OH (April 6, 2018) — During a recent Community Appreciation Event, ERB Electric Company donated a John Deere Gator utility vehicle to Belmont College. The purpose of this equipment donation will be for use in the college facilities department for building and grounds maintenance. 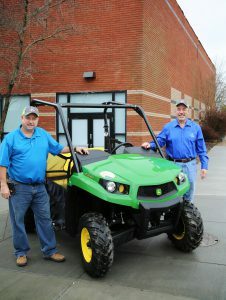 Belmont College employees Dave Kurucz, Maintenance Supervisor, and John Koucoumaris, Vice President Administrative Affairs, pictured with the college’s new John Deere Gator from ERB Electric. In a show of support and appreciate to the local community, ERB Electric donated 20 pieces of lawn/maintenance equipment provided by their sister company, Bridgeport Equipment and Tool, to local schools. Belmont College is just one of many to receive an equipment donation. “We feel this donation will directly impact the area that has supported us in the past, present and in the years to come,” said Justin Klempa, Operations Manager, ERB Electric Company.